C’mon, Gary! Give the fans what they want! For once in your life! In case you missed it, the Anaheim Ducks went full on “Mighty Mode” yesterday evening as they donned the original Anaheim Mighty Ducks jerseys for the pregame warmup ahead of their contest against the Detroit Red Wings. Last night’s home opener marked the Ducks’ 25th anniversary and so they marked the occasion in style. Shades of Selanne and Kariya! Or is that Conway and Banks!? Either way, 90s hockey fans got a bit of a nostalgia kick, but unfortunately it was short lived. The Ducks shed their retro uniforms for their brand new “vintage inspired” third jerseys for the game. The new jerseys are similar to the originals, featuring the duck billed goalie mask logo, but they’re just not the same as the original jersey that shocked the hockey world. Again… pretty cool, but just doesn’t have the same retro 90s vibes as the original Mighty Ducks uniform. They're cool, no doubt, but die hard Ducks fans and fans of 90s hockey want the original Mighty Ducks uniform. Which begs the question, “Why not just go full retro?” Well, according to Ducks insider Eric Stephens, that’s exactly what the team wanted to do, but they ran into some opposition from the NHL. Would have been neat if they wore these during game, like in 1993. My understanding is they asked league but did not get approval. Hence the new thirds tonight. Why would they not get approval? 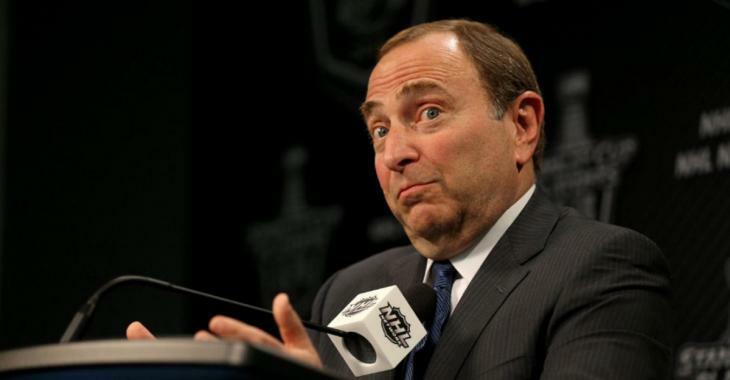 Is Gary Bettman now the Chief of Fun Police as well as the NHL Commissioner now? Is the league afraid that jersey sales would suddenly spike too much for their liking? We literally CANNOT think of a reason as to why the league would veto such a thing. Chances are the Ducks would have sold out of the vintage jerseys last night and the Mighty Ducks would be the talk of the NHL once again. In any case, this is the NHL and Gary Bettman we’re talking about… we really shouldn’t be surprised anymore when we see boneheaded decisions like this one. Just remember: Ducks fly together.